Starring the voices of Owen Wilson, Cristela Alonzo, Chris Cooper, Armie Hammer, Bonnie Hunt, Larry the Cable Guy, Nathan Fillion, Kerry Washington, and Lea DeLaria. I love Pixar, but Cars is their one franchise that always felt kind of phoned in. The first one was good, but not great. The second one was the first Pixar film where I saw the TV spots and thought, “Pass.” I did buy it on Blu-Ray and watch it because I can’t have a gap in my Pixar library, and…yeah. It’s not good. But when I started seeing the first trailer for Cars 3 which featured our hero Lightening McQueen being totaled in a race I thought, “OK. You have my interest again.” And here we are. Lightening McQueen has been king of the racing circuit for a decade now. But the next generation of racers is nipping at his heels, and Lightening sees his old compatriots retiring one by one. In the final race of the season, Lightening tries a risky move to overtake a cocky upstart named Jackson Storm, and it leads to the wreck we saw in the trailer. After an off-season of sulking, Lightening decides that he’ll retire when he wants to, and his sponsor sets him up in a state-of-the-art training facility with one of the toughest trainers in the game, Cruz Ramirez. But, Lightening soon grows frustrated with his slow progress under Cruz’s new, high-tech training methods, and goes for a more old-school training regime. So, Lightening and Cruz hit the road to continue Lightening’s training, with the first race of the season at the end of the road. Will Lightening get his mojo back and reclaim the top spot from Jackson Storm? Will Cruz ever achieve her dreams of becoming a racer? Dude, I swear, this is Pixar’s most photo-realistic film to date. The animation is drop-dead gorgeous. It looks like they used real photographs in some places. The voice acting is also good, with Cristela Alonzo being pitch-perfect as Cruz, and Nathan Fillion using his charm for evil purposes as Sterling, Lightening’s new sponsor. And if you hate Larry the Cable Guy’s Mater the Tow Truck, you’ll be pleased to know he’s once again reduced to his comedic sidekick role. In fact, his role is reduced so much, it’s pretty much a glorified cameo. And you know what? Turns out Mater’s OK in very small doses. Yeah…the plot is formulaic and cliched as hell. While I did see one of the twists coming from miles away, it was still a pretty good twist. 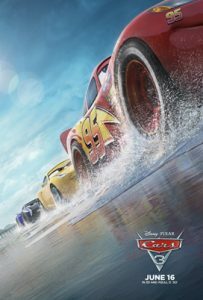 Cars 3 finally has some of that trademark Pixar heart that the other films were lacking. Not much, but they put in the effort. Like the first film, I put it down as good, but not great.